A Strange Way to Save the World (anthem) (with What Child Is This?). 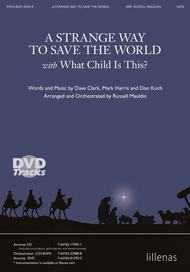 Composed by Dave Clark, Mark Harris and Don Koch. Arranged by Russell Mauldin. For SATB choir and keyboard accompaniment. Anthem. Christmas, general. Difficulty: moderate. Octavo. 12 pages. Published by Lillenas Publishing Company (LP.9780834183544).ISBN 978-0-8341-8354-4. Christmas, general.Open the hearts of your choir and congregation to the emotions of Joseph as he ponders the unfolding events of the nativity. With words and music by the 4Him hit trio Dave Clark, Mark Harris, and Don Koch, this anthem has an engaging a new arrangement and orchestration by Russell Mauldin, along with an accompanying video. You'll wish Christmas could last all year long!